"Would you like to have a taste of the BEST Hyderabadi Biryani?" "Sure, I'll have a taste or two or maybe a plate full. Balaji watched me as I indulged in this savory rice dish filled with spices and saffron. There are different varieties of biryani. Hyderabadi biryani is the most famous and well known among all Indians. This dish originated during the Mughal empire and is made with Basmati rice, spices and goat. As it became popular, variations wee made with chicken instead of goat. My first taste of Hyderabadi biryani was during one of my trips to Hyderabad, India in 2008. One of my cousins took my sister and I on this off the beaten path place near his apartment for dinner. The Megana Biryani Point wasn't much of a restaurant and more of a shack really, but one cannot mistake the aroma of roasted spices mixed with rice and meat for anything but biryani. We eagerly waited while this man behind a small kitchen was cooking our dinner. It's not Hyderabadi biryani if it's not spicy. When I got back to the States, I searched and searched for god spots to eat Hyderabadi biryani and finally found a few, which were comparable to Megana Biryani Point. Below are a few that I found to be good. 1) Deccan Spice Restaurant - Jersey City, New Jersey - Really good! 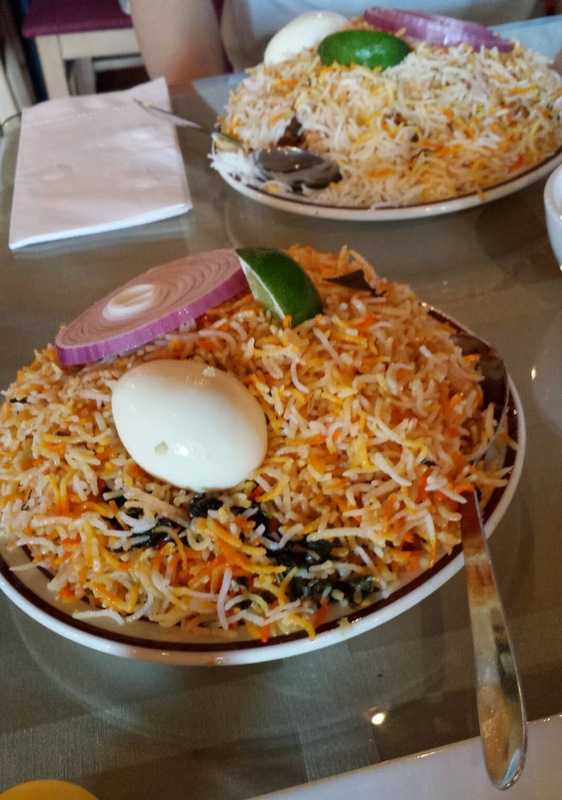 2) Paradise Biryani Pointe - Edison and Parsippany, New Jersey - This was the original restaurant that was famous for Hyderabadi Biryani in Hyderabad, India. My only concern at Paradise was that it was either too mild or too spicy. It's not like in India where they only make it one way. Most places in the US, can make meals mild, medium or hot. However, I found that a couple of times, I found the biryani to be too spicy here. If you can take the heat, go for it. 3) Rajni - Parsippany, New Jersey - The Hyderabadi biryani here is pretty good. Regardless of how spicy you order your dish, it is cooked well. The portion sizes are reasonable as well. The biryani is available with chicken, egg, goat, or plain here. Next time, I will share a picture. 4) Urusi - The Taste of South India - Rockaway, New Jersey - A few weeks ago, I tasted a variety of biryani that I never came across before to this day. It's called Thalappakatti Biryani and it received its name from Mr. Nagasamy Naidu who owned the Anandha Vilas Briyani Hotel in Dindigul, Tamil Nadu (southern state in India). Mr. Naidu always wore a turban called Thalapa, which over the years became synonymous with his brand and cooking styles. 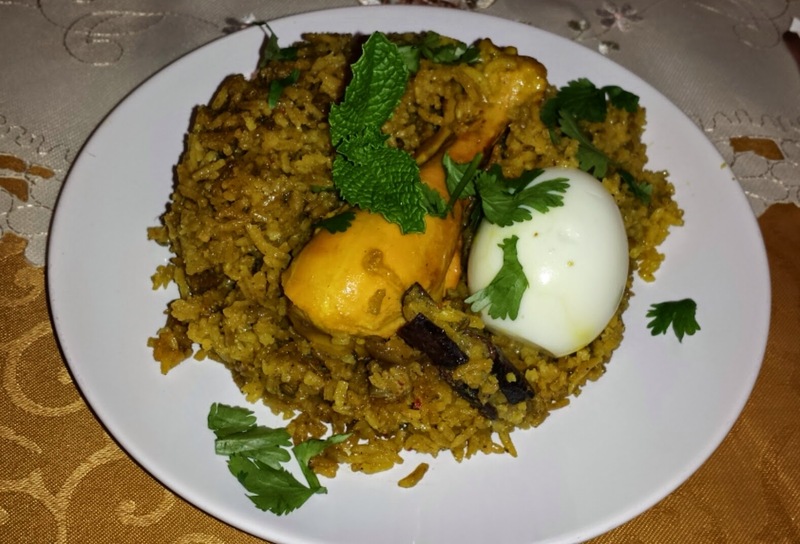 This dish is prepared with Seeragasamba rice or short grain rice; spices, meat, and coconut milk. These ingredients are really what makes this dish unique and flavorful. I wasn't sure whether I would like it or not because it's not like any biryani I have ever tasted. However, I found it to be quite tasty and well seasoned. I also liked the presentation with the sprig of mint laid over the dish. It adds a nice refreshing flavor overall. For the love of biryani, I will continue my journey and seek out best and worst and give it to you as it is. Until next time, LIVE TO EAT not the other way around. Cheers! Quick Tips: If you like taking a ride on the wild side, then try making one of these biryani varieties. You only need to go to your nearest Indian grocer like Patel Brothers or Subzi Mandi and look for brands such as Shah or MTR biryani mix. Do you have a favorite restaurant that makes really good biryani? Share your experience with us. You can also connect with us on Facebook or Twitter. I've felt this emptiness inside of me ever since the demise of my favorite Indian restaurant, Bombay Grill. You may think my behavior is over dramatic but I have my reasons. You see, I'm very picky when it comes to dining out, especially at Indian restaurants. More than the ambiance and decor, I indulge in the food. I can tell when the dishes are made with LOVE and when they are not. The family that owned Bombay Grill cooked with such love and treated their customers very nicely. I was heartbroken when it closed its' doors forever.I was happy to know that although there was no more Bombay Grill, the spot wasn't vacant for long. A new Indian restaurant called Urusi - The Taste of South India opened its doors on Pongal on January 14th the day before Sankranti. We were in the neighborhood and decided to stop by for dinner. The restaurant's entrance was adorned with sugarcane sticks and colorful Christmas lights. The host and owner welcomed us at the door with a smile and seated us to our table. While we looked at our menus, we chatted him up a bit and learned about the restaurant. 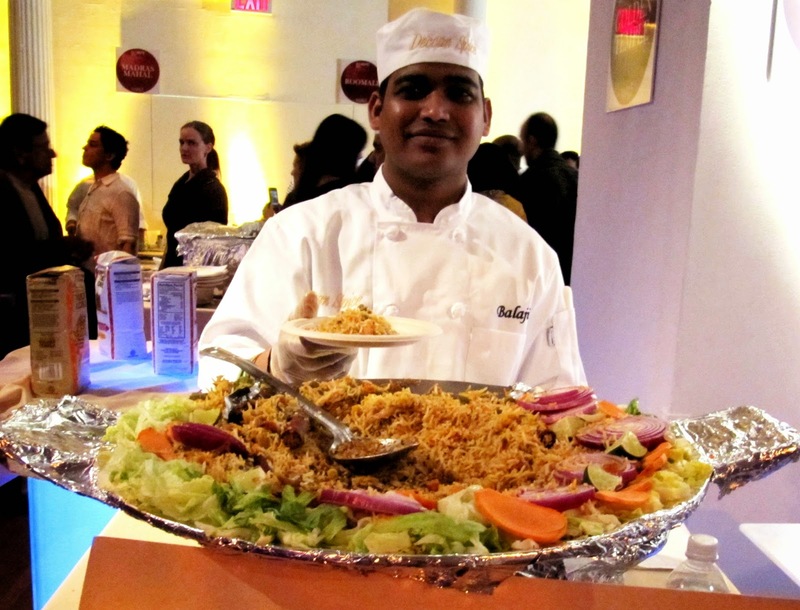 He is originally from Tamil Nadu (Southeast State of India) and came to the United States with his family to start a restaurant business. His brother is the chef and he loves to cook all kinds of South Indian dishes. After the pleasantries, we ordered a plate of idli fry with mint chutney for appetizer and different kinds of dosas (fermented crepe with rice batter, various lentils and/or flours) for dinner. Idlis are steamed rice and lentil cakes. As we enjoyed these crispy and well seasoned idlis, the host brought our dosas out one by one. My father ordered the ever popular Paper Masala Dosa with a side of hot sambhar, seasoned potato curry and coconut chutney. Whereas, my mother and I ordered my favorite, Onion Rava Masala Dosa with the same sides. 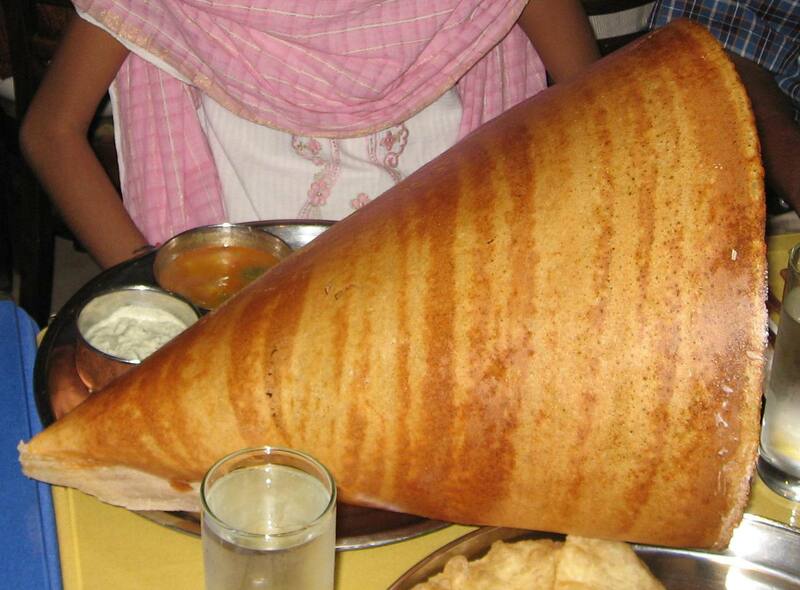 Our dosas were not presented as majestically like my father but that didn't stop us from enjoying them. Onion Rava Masala dosas are typically made with rice batter, semolina flour (sooji) and all-purpose flour (maida). The taste was a bit different from what I've eaten before but it was still tasty. Overall, our dinner was enjoyable and the company was nice. I am looking forward to stopping by again soon to try more of their South Indian dishes. - Urusi is situated in the mini plaza off of Route 46 East in Rockaway, opposite of World Gym and BP Gas Station. - Dosas taste better when eaten hot; so don't take too long to enjoy them because you are taking pictures. to wish everyone a Happy New Year! A new year, new resolutions. 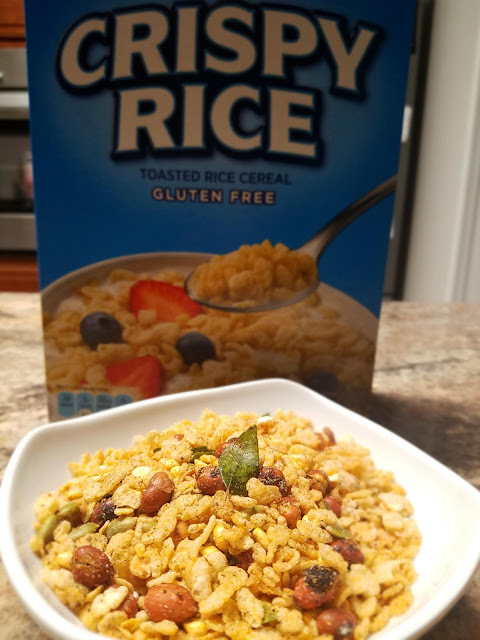 Share new recipes with wholesome ingredients like cracked wheat, ragi, lentils, etc. Review a product every month. Exercise more so I can enjoy these new dishes and recipes along with you. Learn more about my culture and festivals. Now share yours? What do you want to achieve?